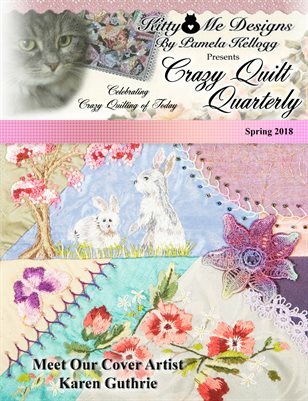 The Spring 2018 issue of Crazy Quilt Quarterly magazine features Karen Guthrie as our cover artist. Karen’s embroidery is outstanding! We also have quilts by Gen Tracey, Nina Burnsides, Betty Pillsbury and a fantastic Christmas tree skirt by Arlene White! Other projects include a crazy quilt window valence by Mary Anne Richardson, an art doll by Kathy Shaw, textile art by Fiona Price, a tutorial by Florence Martin, crazy quilt ornaments by Brenda Sandusky, a cute little snowman by Cris Ruckman and an interesting article on Story Telling quilts by Karen Finch. On a sad note, we’ve lost 2 of our dear crazy quilt friends. Please see our tribute to Lori Kinney and Colleen Anderson. We will surely miss their lovely needlework.